Abstract: I will show that the "missing mass" is not lost somewhere out in the dark regions of space. It is lost within our misunderstood field equations. 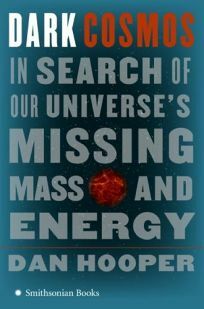 As you can see from this recent book cover, one of the greatest mysteries of cosmology theory is the mystery of the missing mass. According to most computer models, using any number of standard-model theories based on the big bang or similar generators, there appears to be too little mass in the universe to explain current motions, densities, and so on. This is why dark matter was invented: to explain the mass deficit. Over the past few decades, any number of models with varying amounts of cold dark matter or warm dark matter or lukewarm dark matter have been presented, but all of them have problems. I will not gloss these problems, since I believe they are all fake problems, based on bad assumptions and postulates. Meaning, the lost mass is not lost out there somewhere in the dark corners of space. It is lost in the dark corners of bad or misunderstood equations. As tenuous and changeable a solution as dark matter has proved itself to be, it is by far the least esoteric of the current solutions to mass deficit. Hundreds of avant garde solutions have also been offered, some by big names in theoretical physics. I will also ignore these solutions, since they are strictly desperate. Some of them are frankly ludicrous, and merit no reply. Suffice it to say, here, that even the most entrenched standard model folks believe this is a problem not yet solved. Almost no one believes the answer is in hand. Many if not most would admit that the mountain of conflicting theory has reached the point of being a big unsortable mess. Most proposed solutions have little to say for themselves, to differentiate them from any other solutions, and the greater part have the appearance of groping. Even the best solution, dark matter, is so fluid and capricious, it hasn't been able to finally convince anyone. A simple, logical solution to this mystery of the mass deficit has been sitting in full view, tacked onto the end of my paper on charge. But because I haven't put it under its own title and spent any time publicizing it as the solution, it has so far passed mostly unseen and uncommented on. Possibly it will remain in that state even now, but at least I can no longer be blamed for not highlighting it and posting the proper signs. In that paper I showed that charge must have a mass equivalent. In rigorously defining the foundational E/M field as a mechanical field (instead of an abstract or probabilistic field), I proved that this field must have mass or mass equivalence. This does not mean that there is anything wrong with the probabilities of QED; it simply means that there must be a physical field beneath these probabilities, creating them. I showed that this field cannot logically be mediated by so-called "messenger photons," since messenger photons are not mechanical bodies. They are abstract and illogical bodies, with non-mechanical properties or attributes or characteristics. Instead, the foundational E/M field (the field of charge) must be mediated by real bodies. We can call these bodies photons, if we like, but they must give their messages in a mechanical way. To do so, they must have and transfer energy. Real forces cannot be mediated by "virtual" particles. No, charge is and must be the summed mass or energy of these photons. Charge causes a force, and force cannot be imparted by a mechanically undefined field; it must be imparted by something capable of imparting force, and the only thing that is mechanically capable of this is mass or mass equivalence. If we give the radiation that causes the charge the mass required to achieve this force, then we have a form of mass that must be opposed to the mass that creates the gravitational field. By that I mean that the two fields are in opposition to eachother mechanically, and as vectors. One must be negative to the other. By this I do not mean anything esoteric. I am not creating some sort of mystical negative mass. I only mean to point out that every particle’s radiation must have mass, and that this radiated mass creates a vector field that points out, whereas the gravitational mass points in. We already know that, in a sense. However, we have not included the idea in the math, or in the total mass involved in the math. What this means is that the true mass of the particle must be greater than the mass we measure or calculate with our instruments, whatever they are. [I have provided equations for this true mass in my UFT paper.] If you take the mass of the particle to mean only its ponderable, gravitational characteristics, then that mass must be greater than the one we always measure. We are measuring the mass of the particle minus the mass of its radiation. Therefore its true mass is the measured mass plus the mass of the radiation. In the end, this is not because the radiation mass still belongs to the central mass even after it has been radiated—not in any sense at all. No, it is simply an outcome of the math. It is due to vector addition and only to the vector addition. It is a straight outcome of the fact that the gravitational field is one where the vectors point in, and the charge field is one where the vectors point out. This makes the true mass of the central object the addition of the absolute value of both fields. Once you have fully absorbed that, you will have understood that calculating the true mass in this way must vastly increase the total mass of the universe. Over any dt, the mass of any material object is determined by the gravitational acceleration caused by that object during that time, by definition. But up to now, we have only been measuring a compound acceleration, which is the differential of the gravitational acceleration and the foundational E/M acceleration. That is, operationally, we can only measure with our instruments the force due to gravity minus the force due to the mass or momentum of all the radiation. Therefore the true mass must be the measured mass plus the mass of the radiation. 2) The radiation itself has mass or mass equivalence due to energy, which is a second addition to the total mass of the universe. A radiating particle does not lose mass, which means that the “holes” left by radiation are filled. They are filled by recycling this charge. Of course this immediately and simply explains the "mass deficit" in the universe and in current theory. We don't need massive amounts of dark matter or any other ad hoc fixes, since I have just shown the missing matter and energy. All we had to do is define our charge field as a mechanical field instead of as pencil lines or probabilities and we could have avoided this mess from the beginning. They forgot to weigh the universal charge field. Up to now, this extra mass has been hidden in two places, lost there by two fundamental logical errors. As I said, the first error was in not defining the charge field mechanically or physically. The charge field must have mass or mass equivalence. The second error has been in misunderstanding Newton's equation. Newton's equation has always included this foundational E/M or charge field, but no one has seen that. Newton's equation applied to a unified field from the beginning, but he did not see that, and no one since has seen that. His field and equations have been assigned only to gravity. But his numbers are unified field numbers. In this way, both the charge field and the mass of that field have been lost to history, until now. In the same way, the field of QED is also an unrecognized unified field. The quantum field is the same unified field as Newton's unified field, with only one difference. In Newton's equations, it is the charge field that is ignored; but in QED it is gravity that is ignored. Newtons assumed that all motions at his level were caused by gravity. He was wrong. QED assumes all motions at its level are caused by E/M. It is also wrong. At all levels, all motions are caused by the unified field. And, as I have just shown, recognizing this fact completely revolutionizes the vector mechanics. Once the vector mechanics of this pretty simple unified field is sorted out, we find two sources of new mass. Because the unified field is a differential vector field, one component of the field was completely masked by the other one. Once we recognize the existence of this other field, and recognize that this field must be a physical field, we must also recognize an entire new source of mass. This solves, with one stroke of the pen, the entire mystery of the Cosmic Mass Deficit. Addendum, 2010: I have now calculated a mass for the charge field from mainstream numbers and simply mainstream equations, proving that it outweighs the "matter field" by a ratio of 19 to 1. This matches the 95% number we get for dark matter. Dark matter is the charge field. It is not non-baryonic, it is photonic. With equally simple math, I calculate the density of the charge field. It is about 1/12,000 that of normal matter. High mass, low density, just like the WIMPs wanted.